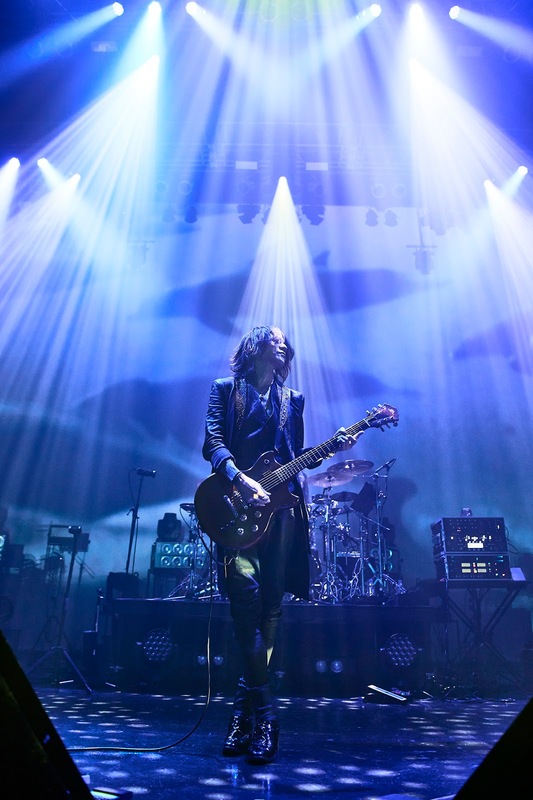 LIVE REPORT: SUGIZO Tour 2016 "The Voyage Home" @ Zepp Tokyo | VKH Press – J-Rock & Visual Kei Coverage Worldwide! SUGIZO put on an otherworldly performance at Zepp Tokyo for his 2016 tour, “The Voyage Home”, his first in 3 years. The show opened with the venue completely dark, broken only by spotlights sweeping the crowd and the hum of white noise. The crowd waited with anticipation, cheering as the support band entered the stage. The cheers turned to screaming as SUGIZO took the stage and hands shot into the air, showing the vulcan salute. 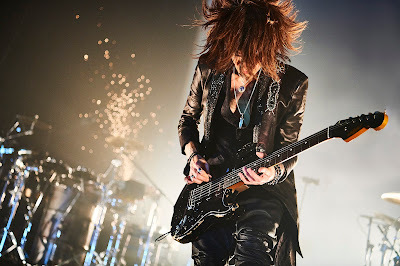 Grabbing his guitar, SUGIZO began strumming to get the crowd hyped and then the room was plunged into total darkness again, as he began the set with “IRA”. Frantic bursts of white lit up the dark screen at the back of the stage and rapidly flashing spotlights set the mood for the upbeat song. He switched guitars for the second song, “TELL ME WHY NOT PSYCHEDELIA?” which opened in candy-colored sweep of pink and blue lights. The beat made the crowd quick to dance and they grooved along as SUGIZO wailed expertly on his guitar. He reminded the crowd gathered there that through his music, he wants to help cleanse all the darkness and grief from the world so that everyone could become one with the light, the good and the universe. With that dream in mind, he continued with “FINAL OF THE MESSIAH”. The stage was flooded with rich, red light as both drums and percussions pounded away relentlessly at the catchy beat. 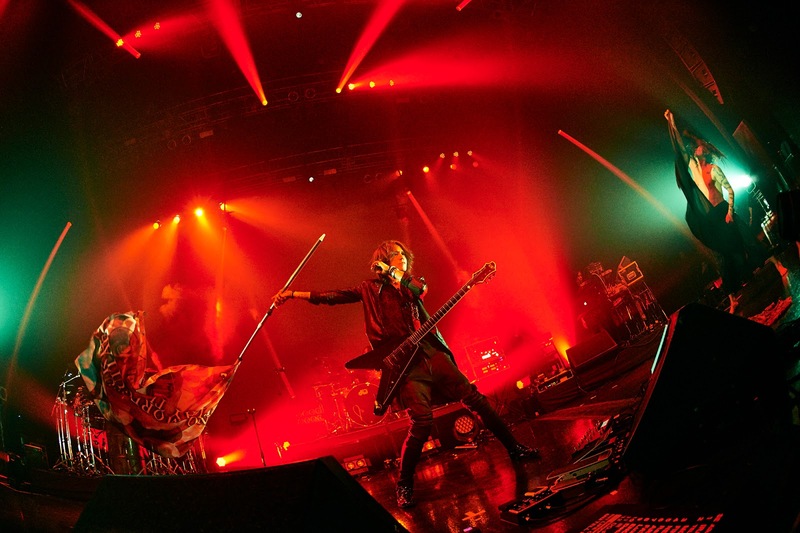 Caught up in the rhythm himself, SUGIZO danced away, gesturing elegantly with his hands. For “NEO COSMOSCAPE”, SUGIZO switched places with his percussionist Kenji Yoshiura, who moved to the center of the stage carrying a djembe. Kenji Yoshiura immediately engaged the crowd, playing short beats and giving the crowd the chance to dance and cheer. 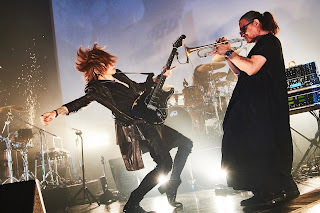 SUGIZO eventually joined him in center stage and the two of them playfully traded beats back and forth in perfect sync while making it look effortless and fun. 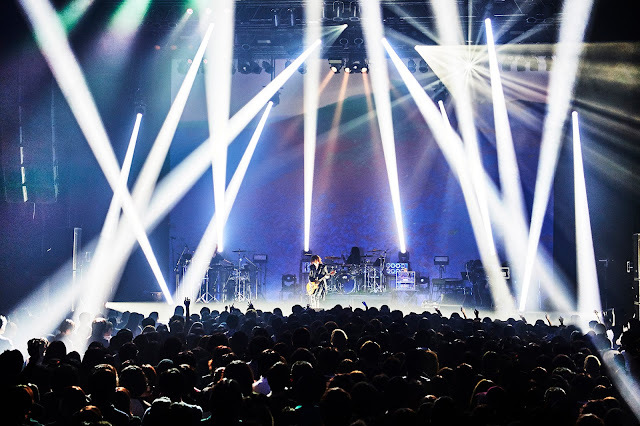 The lights and beats calmed down, leaving SUGIZO standing in a simple spotlight. Using a loop pedal, he expertly layered guitar melodies, building up the track for “Raummusik”. “ARC MOON” transformed the livehouse into an ethereal space, as watery blue lights over the stage and waves on the screen in the back of the stage gave the impression of sinking into the depths of the ocean. SUGIZO’s playing was simultaneously potent yet gentle and it lulled the audience into a respectful hush. Only when the song reached its bridge did the crowd throw their hands in the air, as a voice whispered through the venue. SUGIZO threw his head back and opened his arms wide as the music faded out. Without ending completely, the beat lingered while he switched his guitar for his violin, transitioning seamlessly into “FATIMA”. This time, along with the images of the ocean, the screen overhead showed a carefree woman belly dancing, twirling gracefully in time with the music. 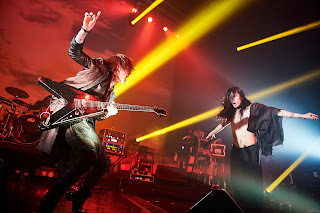 There was a brief pause before “Lux Aeterna” for SUGIZO to change to a guitar and for a guest dancer (ATSUSHI from Dragon Ash) in loose, flowing clothes to take the stage. The beat began, punchy and sharp, hammering through the venue. ATSUSHI tensed for a moment then followed the beat, his body twisting and jerking in time to the abrupt sounds. SUGIZO’s flowing guitar chords cut through the harsh beat and ATSUSHI immediately softened his steps, following the guitar. He alternated between the two, flailing himself around the stage while SUGIZO began headbanging in time to the drumming, still continuing to strum. “ENOLA GAY RELOADED” was an in-your-face protest to the use of nuclear weapons and the anger at the state of the earth. SUGIZO began waving a large flag with the words “No more nukes, play the guitar”, the same as his album. Then he focussed his attention on shredding at the guitar. ATSUSHI who was still on stage followed suit and this time, there were no soft movements. Instead he went all out, throwing himself violently across the stage, adding to the violent images flashing on the screen. The simple words, “No more nukes, pray to music”, brought the song to an end. The energy in the room continued to grow with “Decaying”, SUGIZO went wild on the guitar, his hands moving elegantly over the frets. Behind him, Kenji Yoshiura threw sparks into the air and clanked chains, turning the atmosphere even more frantic. Another guest musician, TOKU came out and began to play the trumpet. It was a loud and powerful performance. “Misogi” and “DO-FUNK DANCE” ended the set on a high note, keeping the audience moving on their feet. SUGIZO walked to the far edges of the stage, making sure that everyone was at full energy and dancing along with them. When it was over, he bowed and left only to return soon after due to the non-stop calls for an encore. He thanked everyone again and acknowledged the viewers at home who were watching at home. He mentioned that 2017 would be 20 years since his solo debut and 25 years since LUNA SEA’s major debut. The enormity of that wasn’t lost on him and he expressed his true gratitude to everyone for their constant support. The next song was a tribute featuring pianist MAIKO and SUGIZO on violin. The venue went still and soft spotlights illuminated the stage. The screen at the back of the stage showed images of a star dying in space as they played a beautiful instrumental cover of David Bowie’s “LIFE ON MARS?”. The crowd was completely entranced and the room was filled with cheers and applause when they finished. 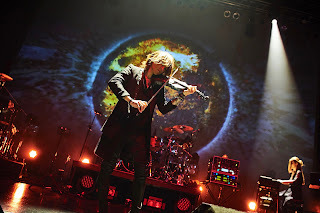 With pictures of the galaxy behind him, SUGIZO played a final melody on his violin, ending with his hands clasped and gazing up. The final song, “TELL ME WHY” ended the concert in a burst of energy that had the entire room going all out.